It’s said that there are three ways that people learn; by example, repetition, or significant emotional event. That first, example, is also a powerful method of communication, and for that matter, often a key instrument of leadership. With that in mind, and given the virulence of this year’s flu strains, here’s look at how U.S. presidents have communicated (and instructed and led) on the topic of influenza and in particular getting annual, seasonal flu shots. Given the power of the bully pulpit, the extraordinary persuasiveness of film, photography, and broadcast TV, and the proven efficacy of the flu vaccine, it’s surprising how little presidents have publicly communicated and led by example on this issue. Below is a brief summary, from 1945 to the present, of presidents and the flu. Surprisingly, we have only one, verified photograph of any president having ever received a seasonal flu shot. For that we have President Barak Obama and his redoubtable White House photographer, Pete Souza, to thank. Though President Kennedy urged Americans to get vaccinated against polio , there is no record of him similarly encouraging vaccination against the flu. His own medical records are not available to the public, but may be viewed by researchers only by permission of the Director of the Archive and in the presence of a physician. From his Presidential Daily Diary, we know only that President Johnson received a flu shot on September 26, 1968. There are no other mentions of flu vaccinations. The Johnson Library archivist speculates that perhaps flu shots were by then so routine they were not recorded. A review of President Nixon’s Presidential Daily Dairy shows no mention of his receiving a flu shot while in office. Nixon’s medical history is held as private and not available for research. 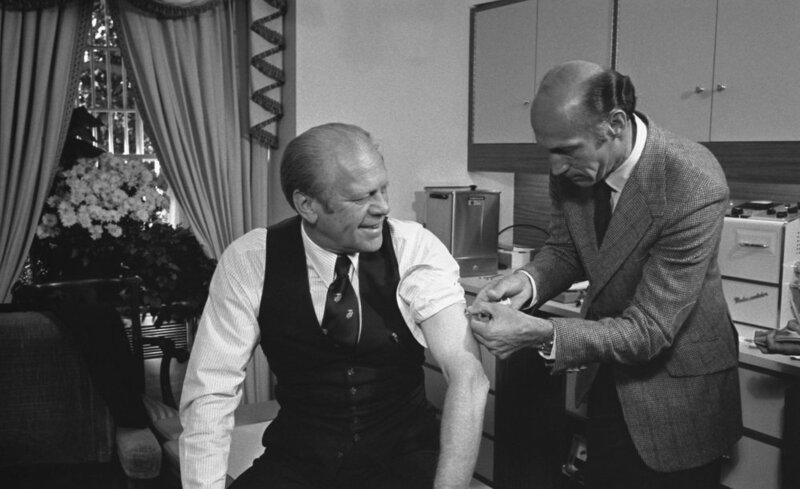 Apparently, the only flu shot President Ford received was for the swine flu on October 14, 1976. He and his family received the vaccine on television and a photograph of Ford’s shot was widely circulated. There is no record of President Carter ever receiving a flu shot. From a March 11, 1985 press release, summarizing President Reagan’s recent physical and medical examination, we know that the president received yearly flu shots as well as “weekly hyposensitization allergy shots.” Photos of four of those shots area shown here, but judging from the dates, it’s unlikely they show flu vaccinations. There is no record of President George H. W. Bush ever receiving a flu shot. There is no record of President George W. Bush ever receiving a flu shot. Valoise Armstrong (Dwight D. Eisenhower Presidential Library, Museum and Boyhood Home), David Clark (Harry S. Truman Presidential Library & Museum), Malisa Culpetter (George W. Bush Presidential Library and Museum), Stacy Davis (Gerald R. Ford Presidential Library & Museum), Mary Finch (George Bush Presidential Library and Museum), Allen Fisher (LBJ Presidential Library), Christian Goos (Barack Obama Presidential Library), Melissa Heddon (Richard Nixon Presidential Library and Museum), Jason Kaplan (William J. Clinton Presidential Library), Emily Mathay (John F. Kennedy Presidential Library and Museum), Brian C. McNerney (Lyndon Baines Johnson Library and Museum), Jennifer Newby (Ronald Reagan Presidential Library), Michael Pinckney (Ronald Reagan Presidential Library), Herbert Ragan (William J. Clinton Presidential Library) Clara Snyder (John F. Kennedy Presidential Library and Museum).